�Hackett�s New York Metropolitan Opera d�but was on 31 January 1919, as Almaviva in IL BARBIERE DI SIVIGLIA, with Frieda Hempel and Giuseppe de Luca. Other operas in which he sang that season were LA TRAVIATA and a novelty, Gounod�s MIREILLE. In all his appearances he garnered exceptional reviews for both his singing and acting. At the conclusion of the New York opera season in April 1921, Hackett decided to sever his connections with the Metropolitan. Manager Giulio Gatti-Casazza had booked a number of new tenors for the 1921�22 season, including Lauri-Volpi, Armand Tokatyan, and Pertile. Added to a roster already featuring Gigli, Martinelli, Chamlee, Orville Harrold, Giulio Crimi, Rafaelo Diaz and Morgan Kingston, there was limited exposure opportunity. 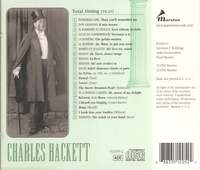 Hackett�s departure from the Metropolitan, however, seemed an ideal time to pursue European performance invitations, so in 1922 Hackett reappeared at La Scala as Rossini�s Almaviva. He then visited Monte Carlo for the first time, singing there Cavaradossi in TOSCA, followed by appearances at the Paris Op�ra as the Duke in RIGOLETTO (with Ritter-Ciampi and the legendary Battastini) to resounding success. Before leaving La Scala, he had been invited by Toscanini to sing Fenton in Verdi�s FALSTAFF the next season. However, the number of American concert bookings this would have required canceling made it an impossibility. In 1923, Hackett made his d�but in London�s Covent Garden to considerable enthusiasm. Among the more notable evenings there in which he participated was the Farewell Performance of Melba in 1926: Rom�o to Melba�s Juliette. On 22 November 1923, the tenor first sang with the Chicago Opera as Alfredo in LA TRAVIATA, beginning an association with that company which lasted into the early 1930s. In addition to the standard repertoire, he created roles in the premieres of Cadman�s A WITCH OF SALEM (with Eid� Nor�na), Moret�s LORENZACCIO (with Vanni-Marcoux), and Hamilton Forrest�s CAMILLE, championed by and starring Mary Garden.